Mark Lawrence's name springs to mind, two of the bloodiest and the most enthralling protagonists sketched in modern fantasy. Jorg, the prince of thorns, a cunning and deadly player of politics and Jalan, the laid-back self-centered young man forced to the ways of magic and politics to save an empire. Both these series are very dear to me. For numerous reasons but the special manner in which Mark writes about the grim truths of life laced with dry acerbic wit and fantastically violent action is just amazingly compelling. And it's his dramatic departure from using the tropes of this genre, spinning his own original stamp on the twists and turns of the events in these remarkable stories that makes him stand tall above others writing today. 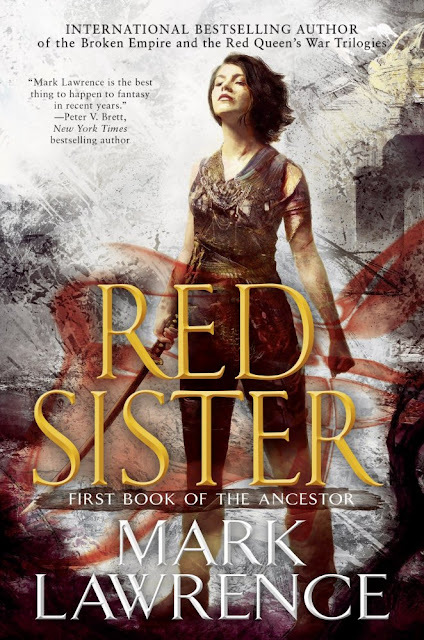 With Red Sister, the first in the Book of Ancestors, Mark's chosen protagonist is a young girl, growing up in a convent, learning the ways of faith and war simultaneously and also discovering truths about herself amidst all the brutal cold whipping in around her world and the treachery and backstabbing that defines her world. Did that make you sit up and take notice? It should. Because yeah - Mark's doing something different this time. And hell, the very first sentence in the book grabbed me by the throat and from then on, it was a headlong flight - through the life and times of Nona Grey, a special young girl who is cast-away by her own mother to a child-taker and then ends up being saved from the hangman's noose by a nun who smuggles her away to a far-distant Convent to begin her eventual training in the ways of faith and violence. It is a fascinating coming-of-age story - and yes, it has it's fill of prophecies about the Chosen One, the daily grind and extensive training within a 'special' school for the gifted that reminds you of many other books. (Harry Potter - and mix it up with Anthony Ryan's Blood Song!) And yet even as I dove right into the depths of Nona's tale, I knew I should just blindly trust this guy to pull a jack-rabbit out of the hat - and twist things up. And does he do exactly that, by Gods. So the narrative cleverly crisscrosses across three different time-lines and Mark also goes in for a dramatic shift from first-person to third person, yet sticking true to Nona’s point of view, the nuances of her compelling personality shining through everything. So stylistically we are reminded of his previous books but this time, somewhere along the way, I got the feeling that Mark is striking out for something really special, very ambitious. The characterization is where Mark usually shines best: Flawed, human but with a spark of goodness, somewhere buried deep within their exterior flaws. But this time in addition to giving us Nona and her friends, Mark has also painstakingly created a glorious world, well thought and beautifully fleshed out, an exceptionally detailed wire-frame on which hangs this perilous and stunning story of Nona and her sisters. Abeth, a world where the sun is dying and ice encroaches upon the living from both the poles forcing men to live within this narrow corridor, whipped on by the brutal cold winds and inhospitable terrains, is the world that the living fled to, from across the stars on their “ships”. And originally there were four tribes who landed in this world: Gerant, known for their brute strength. Hunska, for their unmatchable speed. Marjal, for their ability to fashion and use lesser forms of magic. And lastly Quantal, for their ability to ‘walk the Path’, the higher form of magic that lends people inhuman energies and power. Now with time, the blood has been diluted but there are still births that has traces of these magical abilities. People with one or more such abilities. And are highly sought after by academics, the Church and the Emperor’s people alike. Nona, as we first meet her, is a young eight-year old who is about to be hung for a heinous crime, unthinkable of a young girl: Accused of trying to kill the son of a nobleman. Nona is a hunska, perhaps a full-blood and cannot stand to see wrongs committed against her friends. Her bonds of friendship and loyalty runs very deep and hence, the uncontrollable surge of anger that leads her to commit acts like trying to kill an eight-foot gerant ring-fighter who was hurting her friend. But she is saved by Abbess Glass, a nun of the Convent of Sweet Mercy where they train nuns to channel such magical abilities to become part of orders like the Red Sisters ( Martial ), Grey (Assassins) or dedicated to the Path. But the slights committed against Raymel Tacsis, son of a powerful nobleman who by the way, has also got the Emperor’s favour, are never easily forgotten. Nona comes to know this the hard way, even as she grows from strength to strength under the brutal training of the different Sisters within the convent. Bonds of friendship, the hesitant explorations of the Path, the trails of the Blade-Path, the myriad poison concoctions, all of these that she has learned and all the new bonds she has formed and treasures, are tested with time. Initially, I admit I was thrown off-track by the manner in which Mark started gathering the genre tropes and stacked them on. He went on to build the aura of a prophecy and the chosen one, then brought in the concept of a school for gifted and then tacked on sisters as teacher stereotypes. And I was like, I really hope Mark is going someplace good with all this. But you needn’t worry! After all, he has a legacy of skewering the genre tropes bloody. So in terms of characters, if you thought Nona was the star, then Mark, just as he built the Band of Brothers for Jorg and Jalan’s counterpart in the Vikings gang, paints up some of the most interesting and compelling side-characters, making the tale really come alive. They are mostly the different novices within the Convent that Nona has joined up. Arabella, who initially is the ‘ice-princess’ and the ‘competition’ in the Convent quickly rises up the ranks to be part of Nona’s inner circle. I loved the balance and maturity that Ara’s character brings to the tale. Woven in to the same is also, the impetuous and highly ambitious Clera as well as Hessa, the girl who can best walk the Path who was also Nona’s companion from the days of her capture by the Child-taker. Then of course there are the various sisters in the Convent – a lot of them draw comparisons to the teachers from Hogwarts but be warned, that within the Convent, there are no soft spells – there is only pain, broken bones, shaved heads and worse, poison. Despite the young age of the protagonist, the book is full of unexpected violence. There is the opening scene of Sister Thorn going up against two hundred mercenaries, there are the ring-fights that Nona witnesses and also takes part, there are the competitions within the Convent and that against other institutions – and a countless more. Some sinister and terrifying in its intensity. But for people who got turned off Mark Lawrence’s first series because of the grim nature of the narrative, this would be a wonderful point to get on-board. What I badly missed, was the sense of levity, that grim humor that was the mainstay of both the Jorg and Jalan narrative. The nuns tend to be serious – and Nona, earnest and straightforward. That left maybe, her friends at the convent but sadly no, Mark seems to have left that part out in entirety. All in all, I do feel that this could be Mark’s most defining work yet. The world is limitless and there are so many threads that he can explore. The story of the Red Sister is just getting started – and with the series starter shaking things up quite a bit, the legion of Mark Lawrence’s fans are only set to grow further. This one’s all set to be one of my favourite books this year for sure. 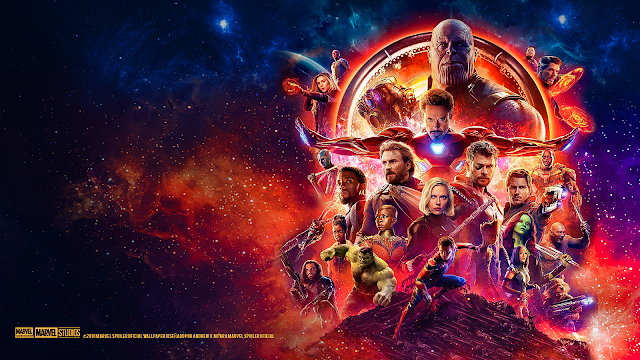 Well, the superbowl of super-hero movies is finally here - Avengers Infinity War!! And it is smashing all sorts of box-office records since its release weeks back. I jumped onto this a bit late as I was traveling the release weekend and so I sensibly avoided all social media till last Thursday when I finally managed to watch it on the big screen. And hells come alive, a good thing too! 2019 Books I am looking forward to. So 2018 was a satisfying year for me - in terms of reading goals, I crept back to a yearly target of 40 + that I had missed last couple of years in a row. So this year, maybe I will up my target to 50 books. And looking at the amazing spread ahead of me, I cannot resist myself! It's going to be another wonderful year with some fantastic titles coming out, some series-ending, some middle books, a few new series starters by ever-favorite authors and quite a few stand-alone books that promises the sun, moon and stars. Here's a few that I picked out, which I personally am quite kicked about. 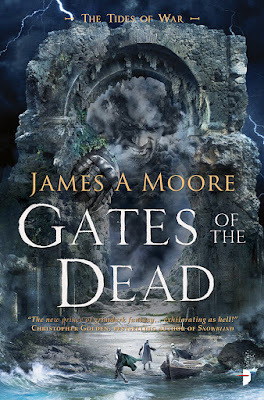 Gates of the Dead by James A Moore.